Malware - is it harmful to the computer? Malicious software known as malware is harmful to the computer. It secretly installs itself on the computer and stays hidden by working silently in the background. It can take some time before the user realizes that malware has been lurking in the computer. Malware can attack the computer in different ways. It depends on the type of malware that invades the computer because each malware performs a specific function. Cryptolocker for example is a type of malware that encrypts files. It holds the file hostage and demands a ransom to release the files. This malware is used mainly for extortion. It can be frustrating, particularly if the file is job related and important. Malware can also monitor computer activities to collect personal information. It can monitor the websites the user visits and record password. By doing so, the personal information of the user gets compromised. That is what malicious malware capable of. Knowing the different types of malware gives us better understanding of what is malicious malware and how it works. Have you heard of the Trojan wooden horse that caused the downfall of Troy? That’s where the term is derived. A trojan is a stealthy software that creates a backdoor for hackers to gain access to the computer. Once the hacker has control of the computer, he can install more malware and turn the computer into a zombie computer. Many users are tricked into installing Trojan because it pretends to be a helpful application. However, this deceptive program is harmful to the computer. Ransomware is spread all over the Internet. It locks the computer and encrypts files, then demands a ransom that ranges from $200 to a thousand dollars just to restore the files. It displays a message saying that FBI has locked your computer because it is used for delivering something illegal. Last year, ransomware damage amounted to $5B according to Cybersecurity Ventures. Derived from the word spy, spyware is used to monitor the victim secretly. It hides in the background so that the user doesn’t have any idea that someone is spying on them. Then it gathers password, pin, and logins. Spyware can be a tool for criminal investigation. However, if it is used for malicious activities, it can be dangerous. Adware is short for advertisement and software that generates countless pop-ups and ads on the computer selling different products. These pop-ups never go away until Adware is removed. Adware ads redirect the user to another page that a hacker controls to collect personal information. The worm is a type of malware that self-replicates independently. It is incapable of overwriting data, but its ability to replicate fast can overload the computer that leads to a reduced performance. A worm can also travel within the network and infect the computers. It is also known for consuming Internet data that can slow down the Internet connection. A virus is a self-replicating malware that destroys files and data. It is often installed through a phishing email and infected attachment. If worm replicates independently, the virus attaches itself to an executable file. When the user runs the file, the virus starts spreading on the computer. A rootkit is one of the most dangerous malware because it is capable of attacking the core of the operating system. When malware resides in the operating system it is often invisible in Task Manager. This means that its activities are undetected. A rootkit is usually bundled with another type of malware used for collecting bank account information. Rootkit removal is difficult; it may require Windows reinstallation. Keylogger is a malware that tracks the keys typed on the keyboard. It is used to steal passwords and sensitive information. Just like Spyware, Keylogger can be helpful too. It can be used for monitoring kids’ social media activities. But hackers use it for committing financial crimes. Now that we know what is malicious malware better, let’s find out if your computer has a malware infection. Did your security setting change suddenly? Chances are, malware has changed it. Malware is capable of lowering the security setting, changing the desktop background, and even the browser setting. If you think that your computer setting has changed for no reason, consider scanning your computer for malware. We have mentioned earlier that malware can overload the computer memory. This leads to slow computer because there is insufficient space for legitimate programs to run normally. If your computer performs slower than before. Check what consumes the computer memory, it could be malware. One major signs of malware in a computer is a program that opens and closes automatically. There’s a possibility that malware has infected the application so it is acting up. Do you think that your computer has malware infection? 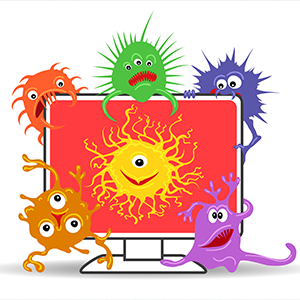 Click here to learn how to remove and prevent malware from the computer.